← How Many Lies Can the WSJ Pack into a Chart on Liar’s Loans? Right now, President Obama is working with leaders of both parties in Washington to reduce the deficit in a balanced way so we can lay the foundation for long-term middle-class job growth and prevent your taxes from going up. A fiscal cliff or a mountain of debt. It will require presidential leadership to avoid either threat. While the likely approach will be to replace the slated policies with a gradual debt reduction plan that would bring the deficit down and leave the debt so that it is no longer growing faster than the economy, there are many different ways to achieve this — all with pros and cons — and many specifics that need to be filled in. . . . . And it’d be nice if we didn’t have to pay for them. But this is the real world that we live in. We have real choices and real consequences. Right now we’ve got significant deficits that are going to have to be closed. Right now we have significant needs if we want to continue to grow this economy and compete in this 21st century hypercompetitive, technologically integrated economy. All of these statements and many, many others like them are false. And all reflect a Washington Consensus about the desirability of austerity that is driving economic policy in America toward a stagnating economy, a plutocratic feudal social order, extremes of economic inequality, and the death of American Democracy. This book is Vol. II of a two volume critique of austerity politics at the Federal level in the United States. It exposes its fallacies, its closed-mindedness and futility, and especially its reliance on wrong-headed conceptions of fiscal sustainability and fiscal responsibility. In Vol. I, I related neoliberalism, the Washington Consensus, austerity politics pushed by the powers that be among the DC Village progressives, and the ideas of fiscal sustainability and fiscal responsibility to the perspectives of Modern Money Theory (MMT), including MMT-based ideas about fiscal sustainability and responsibility. I also explained what I meant by real fiscal responsibility, rather than faux fiscal responsibility, and applied these ideas to an analysis of the US Government during the term of Jimmy Carter. I began my analysis of current progressive ideas and activities by examining the views of Senator Bernie Sanders, and Elizabeth Warren, and then continued by analyzing the operation of the give-up formula among Congressional and DC progressives during the period 2009 – 2010, when the Democrats had big margins in Congress. I then moved to the period 2011 – the present. Next, I analyzed the Campaign for the American Future and its New Populism Campaign, and then concluded by relating the give-up formula to real fiscal responsibility. In this volume, I continue the critique by focusing on The Peter G. Peterson Foundation (PGPF), and inequality. 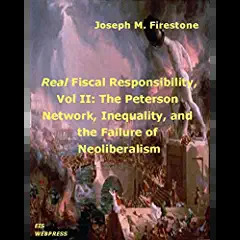 I also continue my examination of faux and real fiscal responsibility in the United States, by examining the dominant network of austerians, neoliberal austerity ideas about fiscal policy, and the primary players in the network, centered around the PGPF and its allies. I also cover the failure of austerity as both program and ideology, if not yet as a formidable political network. In addition, I present a counter-narrative to the austerian story based on Modern Money Theory and the goal of public purpose, develop the relationship between real fiscal responsibility and inequality, and conclude the book and the series with a discussion of the components of public purpose and real fiscal responsibility. More generally, in the two volumes of the series, I attempt to show that the Washington Consensus, austerity politics, and its foundational ideas of fiscal sustainability and responsibility are both intellectually bankrupt, and also that austerity policies based on its flawed notions of fiscal sustainability and responsibility have not only failed to perform as advertised by their advocates, but have also produced the opposite of their promised outcomes, including producing economic stagnation, which has exacerbated economic inequality. In even a minimally rational America, the negative outcomes of austerity-based deficit reduction including its failure to produce full employment, and a healthy economy in which all can share; and its all too successful production of economic stagnation and increasing inequality, would be plain to all and would be at the center of political debate. But in an America where public debate is subject to a continuous cacophony of distracting, contradictory, and confusing messaging from large and powerful corporate interests and from a small group of extremely wealthy individuals, cognitive manipulation of large numbers of people is all too successful at distorting perceptions of reality. So, the mass of people remains easily distracted, and persuaded by myths and rationalizations for fiscal and other policies that have failed time and again across the world. This Kindle e-book, along with Vol. I in the series, dispels the austerian myths about fiscal sustainability/responsibility that prevent Americans from understanding what fiscal policies can contribute toward fulfilling public purpose, and what policies only take us further away from that goal. As I said at the end of Vol. I, a great struggle for the future of American Democracy and for the heritage of the New Deal, the Fair Deal, and the Great Society is now underway. The perspectives developed here will, hopefully help to secure and extend US democracy in all its dimensions, and also FDR’s Economic Bill of Rights, the unfinished business of The New Deal. This entry was posted in Joe Firestone and tagged austerity, inequality, MMT, Modern Monetary Theory, neoliberalism, The New Deal, The Peter G. Peterson Foundation, The Peterson Network. Bookmark the permalink. I can’t thank you enough Joe for all of your work. The entire world depends on an informed society. There are no exceptions in this world; we’re all in this together!